Virtual Receptionist package: Have us answer your calls and we will page, email or call you personally with your urgent messages. Mail Handling package: You may use our address for receiving mail. You have access to the digital postage machine where we print postage for you and take care of sending it out. Access to all office equipment. Access to send/receive faxes via our fax number ($0.25/page). Use of our boardroom for meetings (up to 2 hours/ month). Includes your name listed on our name board both outside the main office door and in the lobby of our building. Come in and out as you please and phone to check for your messages at any time. 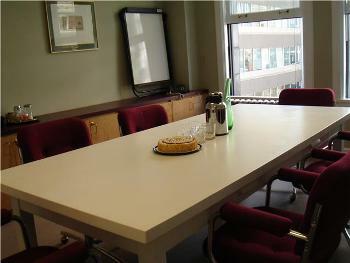 If you require a meeting place for your team or clients, our boardroom is available for rental. Whether you are having a private meeting or an office party, we can arrange food and refreshments to suit your needs. Complimentary coffee and tea come with every rental. Wireless internet connection is also included. Our boardroom comfortably accommodates 8. Rentals start at $25/hour. Please contact us for further rates for 1/2 or full day rentals.